About Us | A1 Sun, Inc.
We're customer-centered, high quality, knowledgeable and friendly. Our goal is to provide the best service and A1 Sun system for you. California contractor's license number 891743. A1 Sun is family owned and managed. Our team of knowledgeable installers and design professionals come from within our local community. Our community is our customer base. Our customer base is our best advocate. A1 Sun installs solar systems of the highest quality. We are committed to providing the best value for our clients, while benefitting the planet by doing business sustainably. Our office is solar powered and charges our expanding electric vehicle fleet. We precycle, recycle, and use environmentally-friendly materials. We are proud of our environmental commitment and socially conscious business practices. We provide superior quality systems, service, and are cost competitive. From the initial contact to your first solar kWh generated, we make sure you are fully informed. A1 Sun is with you at every step of the installation process. We are happy to answer your every question. We firmly believe in what we do. A1 Sun makes installing solar on your home or business easy. A1 Sun provides quality service because we know and use technologies that are proven. In addition, we constantly research and test innovative ideas. From photovoltaic (PV) to solar domestic hot water (SDHW) to electric vehicle charging stations to networked system monitoring, we have a wealth of experience. We design and install lasting, reliable, long term performance. After A1 Sun analyzes your site parameters, we design and build the optimal size system you require. Commercial installations are a growing segment of our business. We are easy to work with. Business owners, architects, contractors and management companies are discovering how well our systems perform. A1 Sun serves each client with the same dedication to individual attention that has provided the foundation of our business. An Alameda County Certified Green Business since our first year in business, we are 100% solar powered. Solar photovoltaic arrays, power our office and charge our electric vehicles. Evacuated tube thermal collectors heat our water. We will soon upgrade our grey water recycling system. We install the same components for our clients that we use ourselves. Our commitment to the environment extends beyond what we do, to how we do it. We precycle, then recycle everything that is possible to recycle. We minimize waste and appropriately dispose of what we cannot recycle. 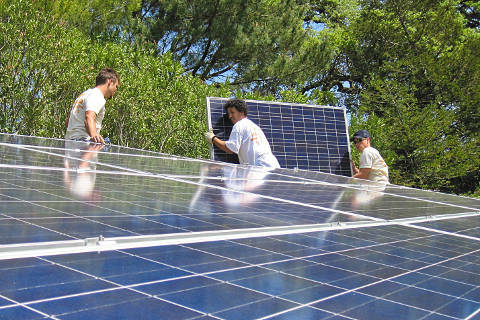 By example, A1 Sun actively promotes solar education and small business growth in the East Bay. We believe it is important to support the next generation. We open up as many opportunities as we can to young skilled workers within our local community, including interns and graduates from Berkeley High School, the Richmond BUILD program and others. A1 Sun has an A listing with the Better Business Bureau because of our trustworthy business practices. Our reputation is built on our integrity and high standard of workmanship. Our goal is to ensure an equitable work environment where all employees exchange consideration and respect. We are honest and open within our A1 Sun Team and with our clients, suppliers, city officials and departments. A1 Sun works with the cities of Albany, Alamo, Benicia, Castro Valley, El Cerrito, El Sobrante, Emeryville, Hercules, Kensington, Lafayette, Moraga, Novato, Oakland, Orinda, Piedmont, Pinole, Richmond, San Anselmo, San Rafael, San Ramon, Vallejo, Walnut Creek and beyond.